The world’s largest rooftop dual-axis solar tracking array is now coming online in Pingtung County, Taiwan. The 498kW solar project is co-developed by Taiwan’s Chailease Finance Co. (CFC), BIG SUN Group and Xianghong Meat Limited, the rooftop provider. 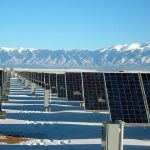 The project utilizes iPV solar trackers developed by Topper Sun, a subsidiary of BIG SUN Group, and was officially commenced operation on November 2nd. The commissioning ceremony was attended by Simon Hou, President of CFC, Summer Luo, Chairman of BIG SUN, Chi-chung Wang, President of Xianghong, and Menam Pan, the Magistrate of Pingtung County, and other guests from Taiwan solar-related companies. The CFC-Xianghong project utilizes iPV solar trackers for optimizing its power output as the trackers follow the sun during the day. All trackers are comprised by 24 PV modules that consisting of 60 multi-si PV cells produced by BIG SUN. Each PV module has a power output of 250~260W, and each iPV solar tracker has a 6kW power capacity. In addition to the grid-connected 498kW capacity, the three companies are now launching the second phase of the project, which will be 342kW. When completely constructed, a 840kW solar array will be installed atop Xianghong’s rooftop. The construction is scheduled to be completed in late 2015. Power generated from the project will be sold back to Taipower Company. The CFC-Xianghong project was completed by three companies. CFC has been focusing on investing in renewable energy development, and the company found Xianghong’s facility is firm enough for installing solar tracking systems. CFC turned to BIG SUN Group and started co-developing the project in May. "CFC has been working with BIG SUN for a long time to develop many PV sites in Taiwan,” said Simon Hou, President of CFC. “We rely on BIG SUN's professional solar products and services, and believe that iPV solar trackers will provide stable energy harvesting and produce over 30% more energy than fixed-tilt systems in this sunshine area." CFC has invested in a total of 23.1 MW of solar power plants till year 2014, and expects to reach total capacity of 50 MW of 200 sites in 2015. Its three-year plan is to develop and invest in 150MW of solar power projects by 2016 with an estimated investment up to NT$9 billion. The Pingtung County government is one of the most ambitious local governments in Taiwan that aims to develop solar power. The Magistrate applauded the cooperation between the three companies and encouraged his officials to support future solar development and manufacturing in the County. BIG SUN has delivered the iPV solar trackers for projects in countries include China and Japan. The company looks forward to create more overseas markets for the world-patented innovation as well as higher market share in Taiwan.